Tender baby chickens are stuffed with rhubarb, wrapped in bacon and braised in a ginger-scented broth. Serve with basmati and wild rice and a bitter leaf salad. Preheat the oven to 180ºC, gas mark 4. Remove the string from the birds, rinse them under cold water, pat dry with kitchen paper and season inside and out. Cut half the butter into 4 pieces. Place a piece of butter, 3-4 chunks of rhubarb and a sprig of rosemary inside each cavity. 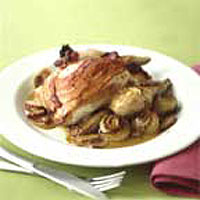 Place the poussins in a large flameproof casserole and lay 3 slices of bacon over the top of each bird. Melt the remaining butter in a sauté pan and fry the shallots on a medium to high heat until they take a little colour. Add the ginger wine and fresh ginger and bring to the boil, then pour around the birds. Cover and cook for 30-35 minutes. Remove from the oven and pierce a leg with a skewer; when the juices run clear the poussins are cooked. Increase the oven to 220ºC, gas mark 7, return the birds to the oven, uncovered, and cook for 10-15 minutes to crisp the bacon. Remove from the oven, transfer the birds to a platter and keep warm. To finish the sauce, place the casserole on the hob and reduce the juices on a high heat for 3-4 minutes. Add the finely sliced rhubarb, cover and cook over a high heat for 2 minutes until it softens, stirring halfway. Remove the lid, stir in the cream and let the juices bubble for 1-2 minutes to thicken. Season. Pour the sauce around the birds and serve.